The Website and its Content is owned by Jo Ann Kobuke, Owner of Midlife Rewritten (“Company”, “we”, or “us”). The term “you” refers to the user or viewer of our Website. Please read these Terms and Conditions (“T&C”) carefully. We reserve the right to change these Terms and Conditions on the Website at any time without notice, and by using the Website and its Content you are agreeing to the T&C as they appear, whether or not you have read them. If you do not agree with these T&C, please do not use our Website or its Content. Intellectual Property Rights Our Limited License to You. You may not in any way at any time use, copy, adapt, imply or represent that our Website or its Content is yours or created by you. By downloading, printing, or otherwise using our Website Content for personal use you in no way assume any ownership rights of the Content – it is still our property. We are granting you a limited license to enjoy our Website and its Content for your own personal use, not for your own business/commercial use or in any way that earns you money, unless we give you written permission that you may do so. The trademarks and logos displayed on our Website or its Content are trademarks belonging to us, unless otherwise indicated. Any use including framing, meta tags or other text utilizing these trademarks, or other trademarks displayed, is strictly prohibited without our written permission. All rights not expressly granted in these terms or any express written license, are reserved by us. By posting or submitting any material on or through our Website such as comments, posts, photos, images or videos or other contributions, you are representing that you are the owner of all such materials and you are at least 18 years old. When you submit to us or post any comment, photo, image, video or any other submission for use on or through our Website, you are granting us, and anyone authorized by us, an unlimited, royalty-free, perpetual, irrevocable, non-exclusive, unrestricted, worldwide license to use, copy, modify, transmit, sell, exploit, create derivative works from, distribute, and/or publicly perform or display such contributions, in whole or in part, in any manner or medium, now known or developed in the future, for any purpose, and granting us the right to make it part of our current or future Website and its Content. This right includes granting us proprietary rights or intellectual property rights under any relevant jurisdiction without any further permission from you or compensation by us to you. You also grant us, and anyone authorized by us, the right to identify you as the author of any of your comments, posts, photos, images, videos or other contributions by name, email address, or screen name. You acknowledge that we have the right but not the obligation to use any contributions from you and that we may elect to cease the use of any such contributions on our Website or in our Content at any time for any reason. Any request for written permission to use our Content, or any other intellectual property or property belonging to us, should be made BEFORE you wish to use the Content by completing the “Contact Us” form on this Website, or by sending an e-mail to joann@midliferewritten.com. We very clearly state that you may not use any Content in any way that is contrary to these T&C unless we have given you specific written permission to do so. If you are granted permission by us, you agree to use the specific Content that we allow and ONLY in the ways for which we have given you our written permission. If you choose to use the Content in ways that we do not specifically give you written permission, you agree now that you will be treated as if you had copied, duplicated and/or stolen such Content from us, and you consent to immediately stop using such Content and to take whatever actions as we may request and by the methods and in the time frame that we prescribe to protect our intellectual property and ownership rights in our Website and its Content. This Website and its Content are not to be perceived as or relied upon in any way as medical advice or mental health advice. The information provided through our Website or Content is not intended to be a substitute for professional medical advice, diagnosis or treatment that can be provided by your own physician, nurse practitioner, physician assistant, therapist, counselor, mental health practitioner, licensed dietitian or nutritionist, member of the clergy, or any other licensed or registered health care professional. Do not disregard professional medical advice or delay seeking professional advice because of information you have read on this Website, its Content, or received from us. Do not stop taking any medications without speaking to your physician, nurse practitioner, physician assistant, mental health provider or other health care professional. If you have or suspect that you have a medical or mental health issue, contact your own health care provider promptly. We are not providing health care, medical or nutrition therapy services or attempting to diagnose, treat, prevent or cure in any manner whatsoever any physical ailment, or any mental or emotional issue, disease or condition. We are not giving medical, psychological, or religious advice whatsoever. This Website and its Content are not to be perceived or relied upon in any way as business, financial or legal advice. The information provided through our Website and its Content is not intended to be a substitute for professional advice that can be provided by your own accountant, lawyer, or financial advisor. We are not giving financial or legal advice in any way. You are hereby advised to consult with your own accountant, lawyer or financial advisor for any and all questions and concerns you have regarding your own income and taxes pertaining to your specific financial and/or legal situation. You agree that we are not responsible for your earnings, the success or failure of your business decisions, the increase or decrease of your finances or income level, or any other result of any kind that you may have as a result of information presented to you through our Website or its Content. You are solely responsible for your results. You acknowledge that we have not and do not make any representations as to the health physical, mental, emotional, spiritual or health benefits, future income, expenses, sales volume or potential profitability or loss of any kind that may be derived as a result of your use of this Website or its Content. We cannot and do not guarantee that you will attain a particular result, positive or negative, financial or otherwise, through the use of our Website or its Content and you accept and understand that results differ for each individual. We also expressly disclaim responsibility in any way for the choices, actions, results, use, misuse or non-use of the information provided or obtained through the use of our Website or its Content. You agree that your results are strictly your own and we are not liable or responsible in any way for your results. WE MAKE NO WARRANTIES AS TO OUR WEBSITE OR ITS CONTENT. YOU AGREE THAT OUR WEBSITE AND ITS CONTENTS ARE PROVIDED “AS IS” AND WITHOUT WARRANTIES OF ANY KIND EITHER EXPRESS OR IMPLIED. TO THE FULLEST EXTENT PERMISSIBLE PURSUANT TO APPLICABLE LAW, WE DISCLAIM ALL WARRANTIES, EXPRESS OR IMPLIED, INCLUDING, BUT NOT LIMITED TO, IMPLIED WARRANTIES OF MERCHANTABILITY, FITNESS FOR A PARTICULAR PURPOSE, AND NON-INFRINGEMENT. WE DO NOT WARRANT THAT THE WEBSITE OR ITS CONTENT WILL BE FUNCTIONAL, UNINTERRUPTED, CORRECT, COMPLETE, APPROPRIATE, OR ERROR-FREE, THAT DEFECTS WILL BE CORRECTED, OR THAT ANY PART OF THE WEBSITE, CONTENT ARE FREE OF VIRUSES OR OTHER HARMFUL COMPONENTS. WE DO NOT WARRANT OR MAKE ANY REPRESENTATIONS REGARDING THE USE OR THE RESULTS OF THE USE OF OUR WEBSITE OR ITS CONTENT OR ON THIRD-PARTY WEBSITES IN TERMS OF THEIR CORRECTNESS, ACCURACY, TIMELINESS, RELIABILITY OR OTHERWISE. We try to ensure that the availability and delivery of our Website and its Content is uninterrupted and error-free. However, we cannot guarantee that your access will not be suspended or restricted from time to time, including to allow for repairs, maintenance or updates, although, of course, we will try to limit the frequency and duration of suspension or restriction. To the fullest extent permitted by law, we will be not be liable to you for damages or refunds, or for any other recourse, should our Website or its Content become unavailable or access to the them becomes slow or incomplete due to any reason, such as system back-up procedures, internet traffic volume, upgrades, overload of requests to the servers, general network failures or delays, or any other cause which may from time to time make our Website or its Content inaccessible to you. We make no warranty or guarantee as to the accuracy, timeliness, performance, completeness or suitability of the information on our Website or its Content. Every effort has been made to present you with the most accurate, up-to-date information, but because the nature of scientific research is constantly evolving, we cannot be held responsible or accountable for the accuracy of our content. We assume no liability for errors or omissions on the Website, its Content, or in other information referenced by or linked to the site. You acknowledge that such information may contain inaccuracies or errors to the fullest extent permitted by law. We may provide links and pointers to other websites maintained by third parties which may take you outside of our Website or its Content. These links are provided for your convenience and the inclusion of any link in our Website or its Content to any other website does not imply our endorsement, sponsorship, or approval of that website or its owner. We do not endorse and we are not responsible for the views, opinions, facts, advice, statements, errors or omissions provided by external resources referenced in our Website or its Content, or their accuracy or reliability. We have no control over the contents or functionality of those websites and so we accept no responsibility for any loss, damage, or otherwise that may arise from your use of them. It is your responsibility to review the terms and conditions and privacy policies of those linked websites to confirm that you understand and agree with those policies. You may establish a hypertext link to our Website or Content so long as the link does not state or imply any sponsorship, endorsement by, or ownership by in our Website or Content and does not state or imply that we are have sponsored, endorsed or have ownership rights in your website. However, you may not frame or inline link our Content without our written permission. By purchasing and/or using our Website and its Content in any way or for any reason, you also implicitly agree to our full Disclaimer which may be found on this Website. You agree at all times to defend, indemnify and hold harmless our Company, as well as any of our affiliates, agents, contractors, officers, directors, shareholders, employees, joint venture partners, successors, transferees, assignees, and licensees, as applicable, from and against any and all claims, causes of action, damages, liabilities, costs and expenses, including legal fees and expenses, arising out of or related to our Website, its Content or your breach of any obligation, warranty, representation or covenant set forth in these T&C or in any other agreement with us. We will not be held responsible or liable in any way for the information, products or materials that you request or receive through or on our Website and its Content. We do not assume liability for accidents, delays, injuries, harm, loss, damage, death, lost profits, personal or business interruptions, misapplication of information, physical or mental disease, condition or issue, or otherwise, due to any act or default of anyone or any business, whether owners, staff, agents, joint venture partners, contractors, vendors, affiliates or otherwise, affiliated with us. We do not assume liability for any owners, staff, agents, joint venture partners, contractors, vendors, affiliates or otherwise who is engaged in rendering our Website or its Content, or in any way or in any location. In the event that you use our Website and its Content or any other information provided by us or affiliated with us, we assume no responsibility. In no event will we be liable to any party for any type of direct, indirect, special, incidental, equitable or consequential damages for any use of or reliance on our Website and its Content, or on those affiliated with us in any way, and you hereby release us from any and all claims; including, without limitation, those related to lost profits, personal or business interruptions, personal injuries, accidents, misapplication of information, or any other loss, physical or mental disease, condition or issue, or otherwise, even if we are expressly advised of the possibility of such damages or difficulties. Certain sections of the Website or its Content may allow you to make purchases from us or from other merchants. If you make a purchase from us on or through our Website or its Content, all information obtained during your purchase or transaction and all of the information that you give as part of the transaction, such as your name, address, method of payment, credit card number, and billing information, may be collected by both us, the merchant, and our payment processing company. Your participation, correspondence or business dealings with any affiliate, individual or company found on or through our Website, all purchase terms, conditions, representations or warranties associated with payment, refunds, and/or delivery related to your purchase, are solely between you and the merchant. You agree that we shall not be responsible or liable for any loss, damage, refunds, or other matters of any sort that incurred as the result of such dealings with a merchant. Payment processing companies and merchants may have privacy and data collection practices that are different from ours. We have no responsibility or liability for these independent policies of the payment processing companies and Merchants. In addition, when you make certain purchases through our Website or its Content, you may be subject to the additional terms and conditions of a payment processing company, Merchant or us that specifically apply to your purchase. For more information regarding a Merchant and its terms and conditions that may apply, visit that merchant’s Website and click on its information links or contact the Merchant directly. You release us, our affiliates, our payment processing company, and Merchants from any damages that you incur, and agree not to assert any claims against us or them, arising from your purchase through or use of our Website or its Content. We reserve the right in our sole discretion to refuse or terminate your access to the Website and its Content, in full or in part, at any time without notice. In the event of cancellation or termination, you are no longer authorized to access the part of the Website or Content affected by such cancellation or termination. The restrictions imposed on you in these T&C with respect to the Website and its Content will still apply now and in the future, even after termination by you or us. If you have any questions about these T&C, please contact us at joann@midliferewritten.com. The website and its content is owned by The Kobuke Group, LLC (“Company”, “we”, or “us”). The term “you” refers to the user or viewer of www.midliferewritten.com (“Website”). A name and an email address so we can deliver our newsletter to you – you would be affirmatively consenting to this by providing this to us in our contact forms. Please note that the information above (“Personal Data”) that you are giving to us is voluntarily, and by you providing this information to us you are giving consent for us to use, collect and process this Personal Data. You are welcome to opt-out or request for us to delete your Personal Data at any point by contacting us at joann@midliferewritten.com. To maintain our Website’s high quality, we may use your IP address to help diagnose problems with our server and to administer the Website by identifying which areas of the Website are most heavily used, and to display content according to your preferences. Your IP address is the number assigned to computers connected to the Internet. This is essentially “traffic data” which cannot personally identify you, but is helpful to us for marketing purposes and for improving our services. Traffic data collection does not follow a user’s activities on any other websites in any way. Anonymous traffic data may also be shared with business partners and advertisers on an aggregate basis. We may use the standard “cookies” feature of major web browsers. We do not set any personally identifiable information in cookies, nor do we employ any data-capture mechanisms on our Website other than cookies. You may choose to disable cookies through your own web browser’s settings. However, disabling this function may diminish your experience on our Website and some features may not work as intended. Contract. We will contact you under our contractual obligation to deliver goods or services you purchase from us. Legitimate Interest. We may contact you if we feel you have a legitimate interest in hearing from us. For example, if you sign up for a webinar, we may send you marketing emails based on the content of that webinar. You will always have the option to opt out of any of our emails. Receive Personal Data portability and transference to another controller without our hindrance. You may unsubscribe from our e-newsletters or updates at any time through the unsubscribe link at the footer of all email communications. If you have questions or are experiencing problems unsubscribing, please contact us at joann@midliferewritten.com. We take commercially reasonable steps to protect the Personal Data you provide to us from misuse, disclosure or unauthorized access. We only share your Personal Data with trusted third parties who use the same level of care in processing your Personal Data. That being said, we cannot guarantee that your Personal Data will always be secure due to technology or security breaches. Should there be a data breach of which we are aware, we will inform you immediately. The website is owned by Jo Ann Kobuke and The Kobuke Group, LLC. By viewing this website or anything made available on or through this website, including but not limited to programs, products, services, opt-in gifts, e-books, videos, webinars, blog posts, e-newsletters, consultations, e-mails, social media and/or other communication (collectively referred to as “Website”), you are agreeing to accept all parts of this Disclaimer. Thus, if you do not agree to the Disclaimer below, STOP now, and do not access or use this Website. I am not, nor am I holding myself out to be a doctor/physician, nurse, physician’s assistant, advance practice nurse, or any other medical professional (“Medical Provider”), psychiatrist, psychologist, therapist, counselor, or social worker (“Mental Health Provider”), registered dietician or licensed nutritionist, or member of the clergy. As a Women’s Coach, I am not providing health care, medical or nutritional therapy services, or attempting to diagnose, treat, prevent or cure any physical, mental or emotional issue, disease or condition. The information provided in or through my Website pertaining to your health or wellness, exercises, relationships, business/career choices, finances, or any other aspect of your life is not intended to be a substitute for the professional medical advice, diagnosis or treatment provided by your own Medical Provider or Mental Health Provider. You agree and acknowledge that I am not providing medical advice, mental health advice, or religious advice in any way. Always seek the advice of your own Medical Provider and/or Mental Health Provider regarding any questions or concerns you have about your specific health or any medications, herbs or supplements you are currently taking and before implementing any recommendations or suggestions from our Website. Do not disregard medical advice or delay seeking medical advice because of information you have read on this Website. Do not start or stop taking any medications without speaking to your own Medical Provider or Mental Health Provider. If you have or suspect that you have a medical or mental health problem, contact your own Medical Provider or Mental Health Provider promptly. The information contained on this Website has not been evaluated by the Food and Drug Administration. I am not an attorney, or financial advisor, nor am I holding myself out to be. Although I am a retired CPA, in the role of a Women’s Coach, I am not holding myself out to be an accountant, or a financial advisor. You agree and acknowledge that I am not providing accounting services, or financial advice of any nature. Any information contained in this Website is not intended to be a substitute for legal or financial advice that can be provided by your own attorney, accountant, and/or financial advisor. Although care has been taken in preparing the information provided to you, I cannot be held responsible for any errors or omissions, and I accept no liability whatsoever for any loss or damage you may incur. Always seek financial and/or legal counsel relating to your specific circumstances as needed for any and all questions and concerns you now have, or may have in the future. You agree that the information on our Website is not legal or financial advice. By using my Website you are agreeing to all parts of the above Disclaimer. If you have any questions about this Disclaimer, please contact me at joann@midliferewritten.com. and get my FREE ebook as a bonus! "5 Easy Steps To Kick Fear To The Curb!" and get my FREE "Your Glorious Act!" 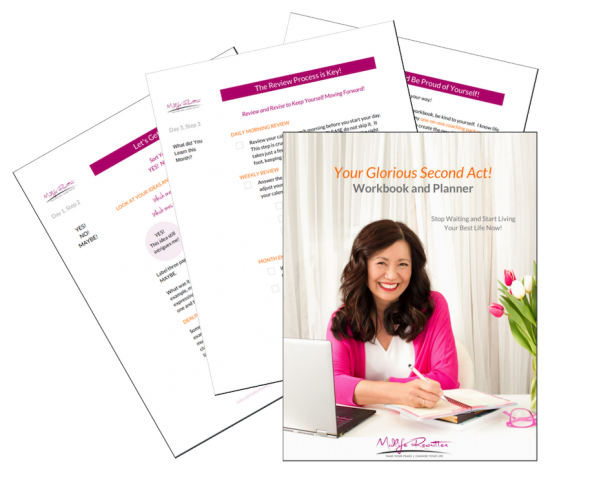 Workbook + Planner as a bonus! Success! Check your inbox to get instant access!